Consistently selling quality bulls in volume doesn’t just happen; our program is designed and built from the ground up, including every facet of their production. At Circle A we strive for continual improvement in everything we do. Every year, with feedback from our customers, we grow a little smarter, we evolve to meet our changing markets and adapt to our environment. Building bulls with greater longevity that transmit genetics targeted for profitability in a commercial setting is our goal and here’s how we do it. We didn’t just hang a sign and claim the right to sell bulls. We run 7,000 commercial cows and we feed out everything that doesn’t make the cut to become breeding stock in our own feedlot and sell all the finished cattle on a quality-based grid. We’ve been very progressive and innovative in our management techniques; we’ve experienced huge successes and a few failures. That knowledge is passed on to our customers through our genetics. We run about 500 cows per man on fescue grass. We’re out there in the freezing cold, the sweltering heat, fighting the mud, praying for rain and thankful for our way of life. Our cows are expected to bring in a respectable calf every year with minimal to no assistance. We work hard, and expect the same from our cowherd. We simply don’t have the time or manpower for bad eyes, bad feet, bad udders or bad temperaments. We raise real cattle for real cattlemen. The number one trait we select for at Circle A is PROFIT! For nearly 20 years, we have been making multi-trait genetic improvement for factors directly related to profitability, using the most accurate genetic selection indexes ever designed in beef cattle production. 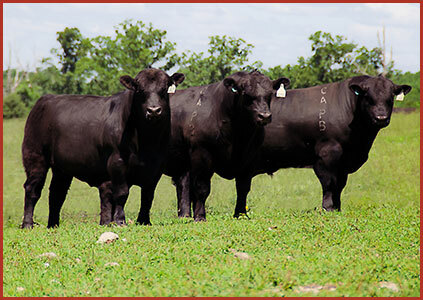 Like the majority of the Angus breed, we continually work to improve calving ease, growth and carcass traits, but unlike the other guys, we also focus on improving economic efficiencies and reducing inputs. We developed the first EPDs for Heifer Pregnancy and Cow Stayability in the Angus breed. Our indexes place added emphasis on females that are fertile and cows that do their job every year without assistance. Since 1998 we have been measuring individual feed intake in structured progeny tests and developed EPDs for reduced feed intake and increased average daily gains. OUR CATTLE DO MORE WITH LESS. Having two bull sales annually affords us the opportunity to sell older bulls than most genetic suppliers. 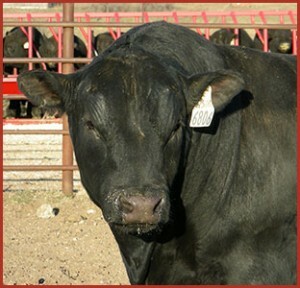 The vast majority of Circle A bulls are marketed at 18-22 months of age. These bulls are ready to go to work, can cover more cows than a yearling and are less likely to fail. Unlike many bull suppliers, these are not the leftover bulls that didn’t sell as yearlings; this is how we market our bulls because it’s better for our customers. Another great advantage of selling older bulls is that we can grow them slower. We can get them to breeding age and weights without trying to make the 1400 pound fat yearling bull that is destined to melt in pasture. We take the development of our bulls very seriously because it directly impacts the longevity that bull will have for our customers, that is why we employ the expertise of professional nutritional consultants to guide the rations fed to our developing stock. We develop our bulls on a low-starch, high-fiber diet primarily composed of corn silage, ground hay and distillers grains. Our goal is to produce athletic bulls with a good libido and increased soundness and longevity. The high-fiber diet and slow gains enabled by selling older bulls allow us to avoid high incidence of acidosis and founder. The bulls are also developed on a high-quality mineral containing Availa 4 to help improve foot health. We are aware of the potential feet issues associated with today’s high-growth Angus genetics. We have recently invested heavily in a few outside sires that we feel offer outstanding feet and leg structure. Like our customers, we desire to use and produce bulls that will maintain their structural soundness and foot integrity for many breeding seasons. We offer a 90 days breeding soundness guarantee on all bulls sold! Every bull we sell is a virgin bull, unless on the rare occasion we offer a herd bull and then it is clearly noted. Every animal on Circle A Ranch is tested negative for being a PI carrier of BVD. Every animal on the ranch is vaccinated with a 5-way respiratory, 7-way clostridial, and injectable wormer at approximately 60 days of age, three weeks prior to weaning and again at weaning. Bulls are vaccinated with the same again as yearlings and pre-sale along with receiving a Lepto-Vibrio vaccine. By the time bulls hit the sale they have been vaccinated five times with respiratory and clostridial vaccines, had two rounds of protection against venereal disease and been wormed five times. Bulls are then required to pass a breeding soundness exam performed by Genex, who does more breeding soundness exams than any company in the state of Missouri. Built Better Bulls are available twice a year at our bull and heifer sales the third Saturday in March and the third Saturday in October. Why buy your bulls anywhere else when you can partner with a professional genetic supplier building better bulls from the ground up with you in mind? 99% of Circle A customers will never register a calf. A registration paper is only as good as the database behind it and that is only as good as the integrity of those who collected and submitted the data. Circle A Premium Bulls are backed by generations of AI sires, and have more weights, measurements, ratios, EPDs and indexes than most registered cattle. When you by a Circle A Premium Bull you get a certificate from Circle A containing their pedigrees, weights, and EPDs. Most importantly, you get piece of mind knowing that the data on that paper was collected in a true commercial environment and backed by people who honestly care about the integrity of the data and multiplying sustainably profitable genetics for commercial cattlemen. For More information on the CAPB bull, how they are produced and the value they can add to your herd read the Philosophy behind our approach. In 2008 Circle A unveiled their CAPB Contract Production program for producers requiring 10 or more bulls annually. Contract production allows genetics to be better matched for environmental challenges, managerial resources, market targets and is ideal for operations looking to optimize the value of their genetic inputs and rest assured the quality and price of their seed stock will remain intact for the length of the contract.